I have seen this restaurant several times in VivoCity, and I had always found the interior to be very inviting and classy. I never actually had the chance to try it out until yesterday. The Cellar Door is a deli and wine restaurant at the first floor of Vivo City. You can choose to dine indoors or outdoors. Outdoor dining would give you a nice view of Sentosa. However given the heat and humidity in Singapore, I almost always choose to dine indoors. Instead of the normal food fest, my husband and I decided to have a light meal for dinner with some wine. 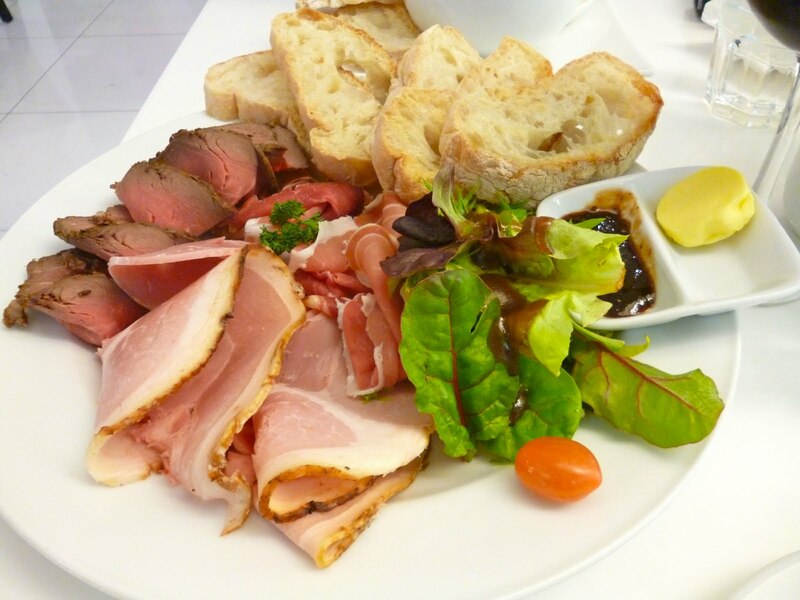 We ordered the Carnivore Sharing Platter (SGD 28.00) -- okay, I admit that doesn't sound light! But it's actually just a platter of cold cuts- prosciutto, honey cured ham, and roast beef served with some bread. The prosciutto was excellent. My husband and I agreed we have not had such good prosciutto in a while. The honey cured ham was good too and went very well with the chutney that was served. The least enjoyable was the roast beef which I felt was a little dry. The bread was awesome. It was crusty yet soft in the middle. Very high quality bread which I would normally only find in good hotels. A glass of wine ranges from SGD 7.50 to SGD 15.00. I am in no way a wine expert, but I did enjoy my glass of red wine with the cold cuts. They also have a proper deli that has a good selection of cheeses. It's a pity I didn't get to try any! Instead of ordering from the menu, you could also choose to come over to the deli and point out which cheese or meats you want for a platter or a sandwich. This restaurant is very pleasant. And given my love for deli food and wine, I will definitely frequent this place and have some manchego or aged cheddar with more of that yummy prosciutto.